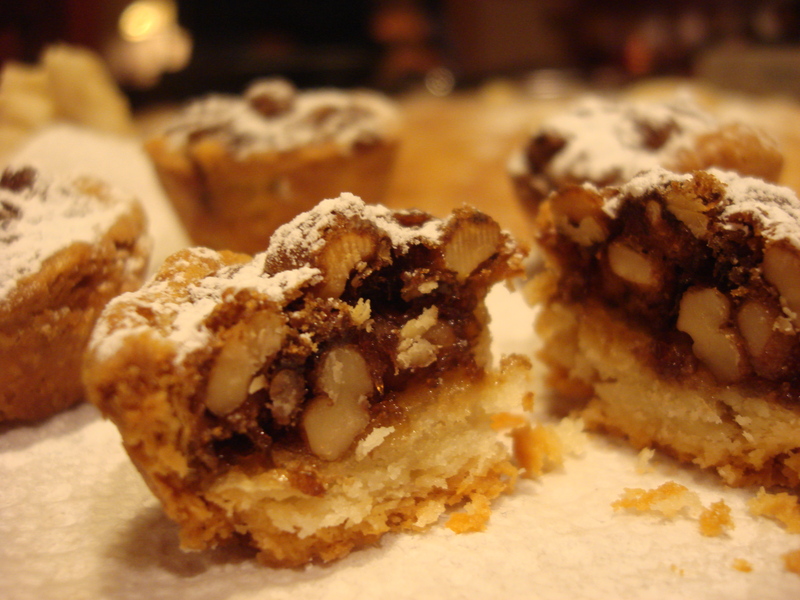 I absolutely cannot believe that I have never posted this recipe! 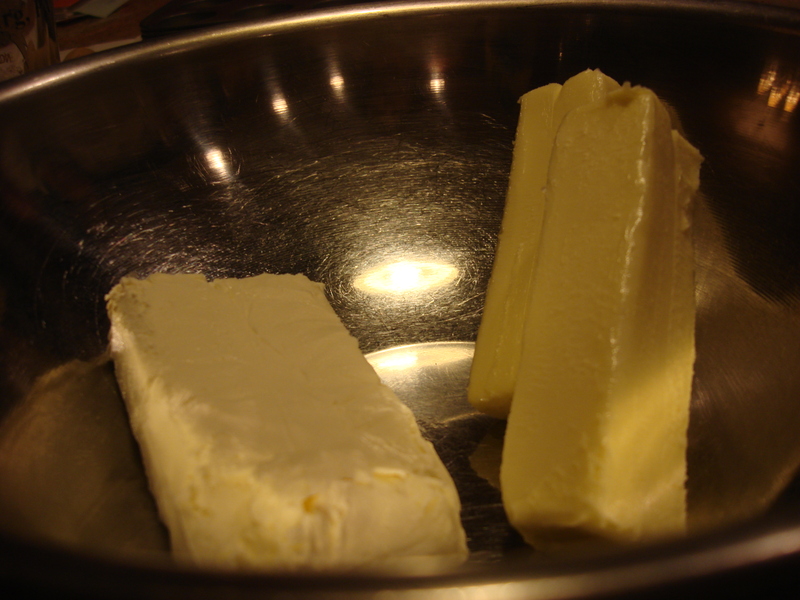 Yes this much butter, this much cream cheese. Get your jaw off the floor and get cooking! I’ve never been much of a baker – I’ve probably mentioned that I am no good at following instructions – but this banana bread is very forgiving of people who are more “more or less” than precise. It’s very child-friendly. Leandro and I put it together often and he takes slices to school to dip in yogurt. I especially like to double it (using about 8 bananas total) and slice up some for his caregivers and my colleagues – everyone feels appreciated and esteemed when they are on the receiving end of home-baked loaves of something. I get a lot of requests for this recipe, so here it is! It also freezes well; check the bottom of the recipe for storing instructions. Preheat oven to 350°. Mash bananas in mixing bowl. Add sugar, eggs and oil, one at a time, mixing well with each addition. Sift dry ingredients together (I use a big strainer) and add to banana mixture. Pour in greased 5×9 loaf pan (or 8×8 oven dish) and bake 55-60 minutes, or until a knife inserted in the middle comes out clean. *We eat a lot of bananas here, but sometimes I buy too many and they get overripe, even for my son, who likes them sweet and eats the dark spots. Or he just wants half of one and I don’t want the other half. Any overripe or half-bananas get thrown into a plastic freezer bag and when I have approximately six, I make banana bread! 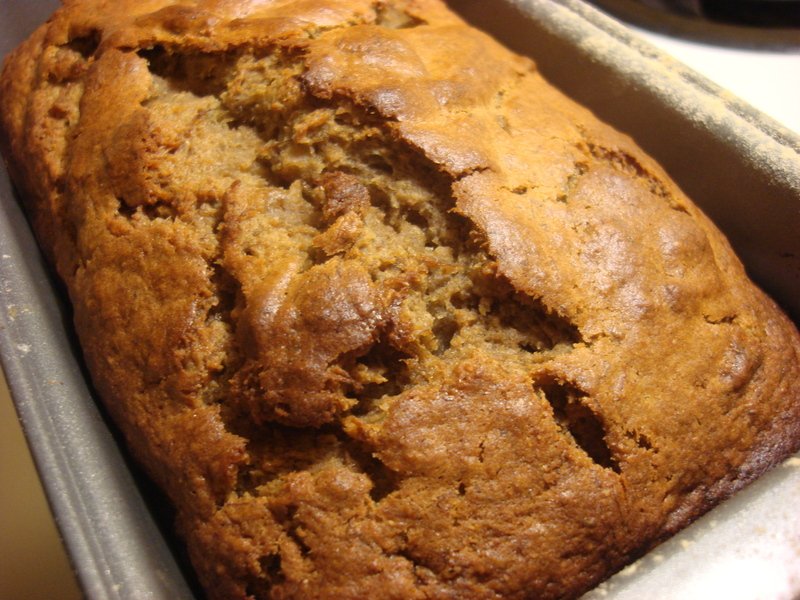 Storage notes: Banana bread should be cooled completely before slicing (I know, fresh-out-of -the-oven warm is so cozy! But it slices much better later on). It stays fresh tightly wrapped out of the fridge for two or three days. The refrigerator isn’t great for it, but you can warm it up a bit before serving. To freeze, slice first, then wrap in foil or plastic wrap and then place in a freezer bag. It’ll keep for at least a month and you can take out a slice at a time when you need a treat.